Global Bible Commentary est le grand livre que vous voulez. Ce beau livre est créé par Daniel Patte. En fait, le livre a 432 pages. The Global Bible Commentary est libéré par la fabrication de Abingdon Press. Vous pouvez consulter en ligne avec Global Bible Commentary étape facile. Toutefois, si vous désirez garder pour ordinateur portable, vous pouvez Global Bible Commentary sauver maintenant. The Global Bible Commentary invites its users to expand their horizon by reading the Bible with scholars from all over the world and from different religious persuasions. These scholars have approaches and concerns that often are poles apart. Yet they share two basic convictions: biblical interpretation always matters; and reading the Bible “with others” is highly rewarding. 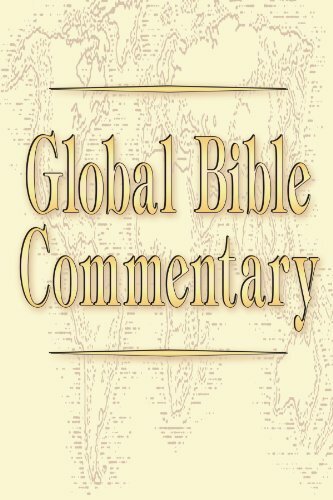 Each of the short commentaries of the Global Bible Commentary is a readily accessible guide for reading a biblical book. Written for undergraduate and seminary students and their teachers, as well as for pastors, priests, and Adult Sunday School classes, it introduces the users to the main features of the biblical book and its content. Yet each short commentary does more. It also brings us a precious gift, namely the opportunity of reading this biblical book as if for the first time. By making explicit the specific context and the concerns from which she/he reads the Bible, the scholar points out to us the significance of aspects of the biblical text that we simply took for granted or overlooked. If any book demonstrates the value of cultural criticism and the importance of particularity in interpretation, this is it! Scholars from diverse social locations in every continent bring their distinctive context to bear on the act of interpreting. In so doing, they shed eye-opening light on the biblical texts. The resulting critical dialogue with the Bible exposes the oppressive as well as the liberating dynamics of the texts while at the same time showing how the Bible might address the social, political, cultural, and economic dynamics of our world today. This collection can change the way you read the Bible―scholars and students, clergy and laity alike. Daniel Patte, Professor of New Testament and Early Christianity at Vanderbilt University, Nashville, TN, USA. A French Huguenot (Église Réformée de France), he taught two years in Congo-Brazzaville, and “read the Bible with” people in France, Switzerland, South Africa, Botswana, the Philippines, as well as in the USA. His publications include books on hermeneutics and semiotics (such as Early Jewish Hermeneutics, 1975; The Religious Dimensions of Biblical Texts, 1990); on Paul and Matthew (such as Paul's Faith and the Power of the Gospel, 1983; The Gospel according to Matthew: A Structural Commentary on Matthew's Faith, 1987), as well as, most directly related to the GBC, Ethics of Biblical Interpretation (1995), The Challenge of Discipleship (1999), Reading Israel in Romans: Legitimacy and Plausibility of Divergent Interpretations (ed. with Cristina Grenholm, 2000), The Gospel of Matthew: A Contextual Introduction (with Monya Stubbs, Justin Ukpong, and Revelation Velunta, 2003). José Severino Croatto,. Professor of Exegesis, Hebrew, and Religious Studies, at Instituto Superior Evangélico de Estudios Teológicos (ISEDET). A contributor to Revista de Interpretación Bíblica Latinoamericana (= RIBLA) and the Movement of Popular Reading of the Bible, he published 22 books, including three volumes on hermeneutics, Exodus, A Hermeneutics of Freedom (1981); Biblical Hermeneutics. Toward a Theory of Reading as the Production of Meaning (1987); Hermenéutica Práctica. Los principios de la hermenéutica bíblica en ejemplos (2002); three volumes on Génesis 1-11 (1974; 1986; 1997), the last one, Exilio y sobrevivencia. Tradiciones contraculturales en el Pentateuco; three volumes on the book of Isaiah (1988; 1994; 2001), the last one, Imaginar el futuro. Estructura retórica y querigma del Tercer Isaías (Isaías 56-66); two volumes on Religious Studies (1994; 2002), the last one, Experiencia de lo sagrado y tradiciones religiosas. Estudio de fenomenología de la religión (2002). Rev. Dr. Nicole Wilkinson Duran, after teaching New Testament in the USA, South Africa (Zululand), in Turkey, is currently teaching part-time at Rosemont College and Villanova University, and with her husband raising twin sons in the suburbs of Philadelphia, PA. She has published articles on topics ranging from gender and race in Esther, to the unread Bible in Toni Morrison’s novels, to body symbolism in the story of John the Baptist’s execution, and edited (with G. Phillips) Reading Communities Reading Scripture (2002). She is an ordained Presbyterian minister and does occasional preaching and adult Christian education. Teresa Okure, SHCJ, a graduate from the University of Ibadan, La Sorbonne, École Biblique of Jerusalem, and Fordham University (Ph.D.), is Professor of New Testament and Gender Hermeneutics at the Catholic Institute of West Africa, Port Harcourt, Nigeria. She is or has been a member of the executive committees of several associations, including EATWOT (Ecumenical Association of Third World Theologians, as Executive Secretary), the International Association for Mission Studies (IAMS), and the Society for New Testament Studies (SNTS). She published more than 100 articles and six books including The Johannine Approach to Mission: a Contextual Study of John 4:1-42 (1988), ed. Evaluating the Inculturation of Christianity in Africa (1990) and ed. To Cast Fire upon the Earth: Bible and Mission. Collaborating in Today’s Multicultural Global Context (2000). Archie Chi_Chung Lee, Professor of Hebrew Bible, Department of Cultural and Religious Studies, The Chinese University of Hong Kong. A specialist of cross-textual hermeneutics, especially Chinese text and the post-exilic biblical tradition. He is the author of several books including A Commentary on the Book of Koheleth, (in Chinese 1990), Doing Theology with Asian Resources: Ten Years in the Formation of Living Theology in Asia (1993, ed.) and Interpretation of the Megilloth (in Chinese 2003) and numerous articles including "Genesis One and the Plagues Tradition in Ps. 105," Vetus Testamentum, 40, (1990): 257-263, "Biblical Interpretation in Asian Perspective," Asia Journal of Theology, 7, (1993): 35-39, "The Chinese Creation Myth of Nu Kua and the Biblical Narrative in Genesis 1-11," Biblical Interpretation 2 (1994): 312-324, "Cross-Textual Hermeneutics on Gospel and Culture". Asia Journal of Theology 10 (1996): 38-48 and "Biblical Interpretation of the Return in the Postcolonial Hong Kong," Biblical Interpretation, 9 (1999): 164-173.